Sydney, Australia, 2013-11-25 — /travelprnews.com/ — The spectacular sight of the soaring white sails of the Sydney Opera House and the iconic Sydney Harbour Bridge will greet guests staying in the new Full Harbour View Junior Suites at Four Seasons Hotel Sydney. In addition to spectacular harbour views, the suite comes with exclusive privileges including complimentary Executive Club access for guests and up to three friends. A private haven for guests, the Executive Club on Level 32 of the Hotel overlooks Walsh Bay and offers deluxe full breakfast buffet with chef-attended egg station, all-day light refreshments, and an evening pre-dinner canapés and premium spirits open bar with an award-winning sommelier selection of wines. Other Executive Club privileges include complimentary garment pressing, high-speed internet access throughout the Hotel, dedicated concierge services, selection of daily newspapers and magazines, and savings on Executive Club boardroom functions. The Full Harbour View Junior Suite features an open-concept living area that includes a lounge area, oversized sleeping and relaxation spaces, and a generous executive business station. Guests staying in the Full Harbour View Junior Suite will also receive luxurious Appelles amenities made from certified organic Australian ingredients in the marble bathroom. 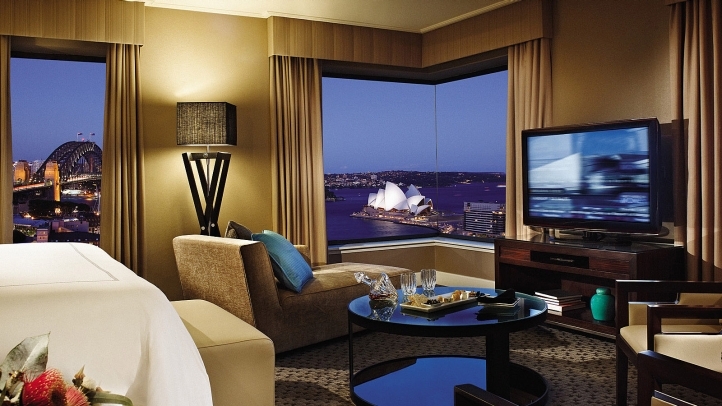 The Full Harbour View Junior Suite is available from AUD 595.00 a night. For reservations, call 02 9250 3100 or book online. This entry was posted in Hospitality, Hotels, Luxury, Resorts, SPAs & Wellness and tagged four seasons, Four Seasons Hotel Sydney, Full Harbour View Junior Suites, Sydney, Sydney Harbour Bridge, Sydney Opera House. Bookmark the permalink.